Fuzz is back in school today and I’m catching up on the usual chores. Instead of cookies, I decided to make something different — Gingerbread Muffins. This recipe calls for crystallized ginger and raisins, but Fuzz doesn’t like things suspended in muffins, so I left out the add-ins. They’re not too sweet and have a nice light texture. I think the addition of chocolate chips would be great here, but these aren’t my muffins, they’re for Fuzz and they’re supposed to be simple and wholesome. Okay, they’re not that wholesome, but you could make them a bit healthier by using white whole wheat flour instead of all-purpose. And doesn’t molasses have iron it it?????? I need to go check that. Update: I have adjusted his recipe a bit since first posting. The changes: I halved it and now make 6 large muffins or 8 slightly smaller muffins. In addition, I now use a mix of oil and butter instead of just butter. I’ve found that adding an additional 3/4 teaspoon of baking powder helps the muffins rise higher. Also, I recommend keeping the raisins in as they add moisture. The crystallized ginger is excellent as well. Do not preheat the oven quite yet because the batter needs to sit. In a bowl, thoroughly stir together flour, salt, baking soda, baking powder, ginger, cinnamon and cloves. In a microwave-safe bowl, heat butter until melted. Stir in oil, molasses and sugar, then add egg and buttermilk. Add flour mixture and stir until blended (batter will still be lumpy). If using, stir in crystallized ginger and dates or raisins. Allow the batter to sit for about 20 minutes, then preheat oven to 425 degrees F.
Grease 10-12 muffin cups. Note: You will be baking the muffins at 375, but getting the oven really hot before you put the muffins in helps them to rise a little higher. Divide evenly among muffin tins filling all the way to the top. Put the muffins in the oven, reduce heat to 375 degrees F and bake on center rack for 20 minutes or until muffins appear set. If making smaller muffins, check after 15 minutes. I hope you enjoy the muffins. They weren’t extremely rich, which in my opinion is a good thing when it comes to muffins. I like rich cakes and lighter muffins. Thanks for the muffin report! Sorry the whole wheat flour didn’t work out, but it’s always good to experiment. Did you add the dates? I’m curious because I think the dates or raisins add to the moisture too. My muffins weren’t dry, but they weren’t the richest and moistest muffins either. I think it’s critical to scoop the flour lightly (or weigh it) and watch the bake-time carefully — especially if you plan on leaving out the add-ins. I made these tonight, subbing 2 of the cups with Whole Wheat. I also did not add the optional ingredients. These had a great flavor but turned out so dry that butter was a requirement. So I just wanted to let y’all know that the WW dries them out. I will make this recipe again (oh how yummy my house smells!) but next time I will not use quite so much WW. Anna, I LOVE love your blog. I have tried many of the recipes. Reading it makes me SMILE! I wish I had six kids so I could make loads and loads of muffins, but I don’t and have to store them. What I do is let them cool completely, wrap them in plastic wrap (Saran Wrap or Glad Cling Wrap) and freeze them. Hey your site is one of my absolute favorite blogs–I figured it was time I left a comment. The muffins look awesome–I agree with your daughter as I don’t like much suspended in my muffins either. I was wondering what your favorite method was for storing muffins and how long you got them to last? Anna, what a wonderful muffin! It’s so beautifully domed… and I bet it was delicious. As an expat myself, I can tell you that you want to use Lyle’s black treacle to replace molasses. It is slightly thicker, but the taste is basically the same. That looks good. My muffins never come out with such pretty tops! I might give these a try with some chocolate chips. Laura, these would be good with cream cheese icing. However, I think they are lighter than most cupcakes. 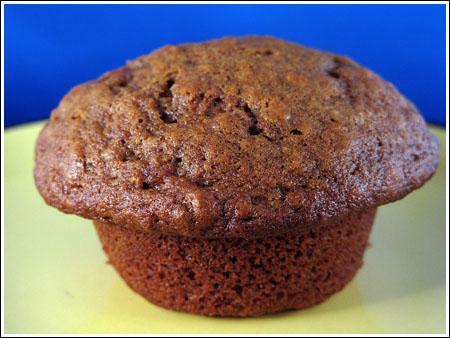 They seem more like gingerbread in muffin form than like ginger cakes. Elisabeth, you are right! I checked the label and one tablespoon of molasses has 4% daily requirement of calcium…..so that’s pretty good, I guess….it’s something! Cakespy, the good news is Fuzz loved them, so that’s good for my soul. She’s picky about muffins, but these passed the test. I’m glad I left out the add-ins. Helene, most of the British recipes (I don’t have any French ones yet) call for “treacle” so I think your best bet would be treacle. I’m not sure how strong treacle is or whether or not it comes in varying strengths, but I think you’d be fine if you bought a popular brand of treacle. Here, we use molasses. Most people just use what is called mild or unsulphured molasses. Some people, not anyone I know, use “unsulphured” or “blackstrap”. I don’t these types are used in baking much, but rather for other things. If you are in doubt, you could order Grandma’s Brand Molasses online. Kim, I can’t wait to hear how the ginger/chocolate version works. JEP, it doesn’t feel very wintery here, but you are right ;). Christie, good point! The ginger itself is healthy. Inflammation is at the core of so many ailments so ginger is a superstar ingredient ;). And I checked the molasses bottle and it has a decent amount of iron. Oh, I don’t think you’d blow up if you ate the amount of sweets I do. I eat small portions, which is why I tend to like sweets with more fat….they’re more satisfying mentally and physically. The things that do me in are low fat sweets like Snackwell cookies or sugary cereal or granola or other high carb semi-low fat foods….I start eating and can’t stop. But I’m good after a few bites of something super rich. Yes, Molasses is a good source of iron just to help “Justify” the whoelsomeness of the muffins. Not to mention ginger is good for infmallation! They looks great. And the picture of you and your daughter is so cute. How do you manage to stay so tiny and eat all those sweets, I too love sweets but would blow up if I ate them all the time! Mmm…look delicious & gingerbread is a perfect winter flavor! 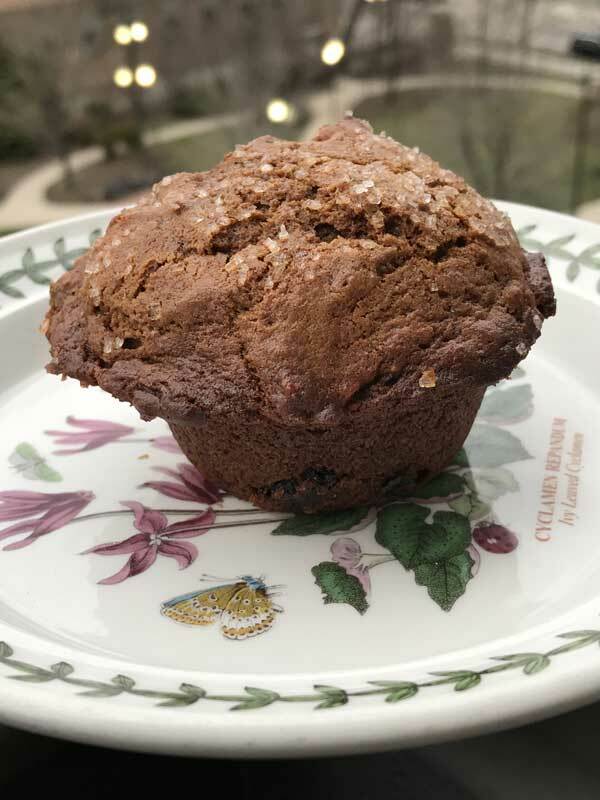 I have a few bars of Lindt Holiday Spice dark chocolate bars I got on clearance after Christmas that would taste DIVINE chopped and added to these muffins! I’m inspired! These look good! I was wondering if you would be so kind as to take a photo of your molasses??? Well, I’ve had a look in a picture dictionary but I’m not sure I’ve got it right… Last time in the cookies, I replaced it by Golden syrup which is all I can get here that looks similar, but it’s not the same is it? Maybe not “good” for your body, but very good for your SOUL. I think molasses has lots of calcium in it. 🙂 These look really good! I made a similar recipe, but it was cupcakes (which is really just a frosted muffin, right?). I spread the tops with cream cheese frosting–so good!